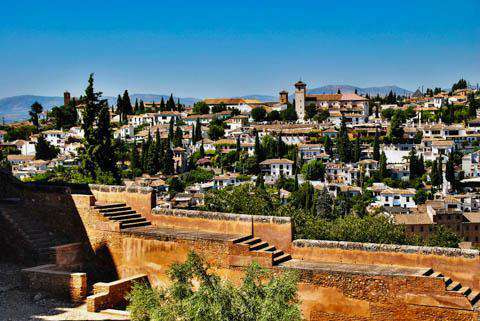 How much does it cost to travel to Granada? How much money will you need in Granada? €57 ($64) is the average daily price for traveling in Granada. The average price of food for one day is €16 ($18). The average price of a hotel for a couple is €57 ($64). Additional pricing is in the table below. These average travel prices have been collected from other travelers to help you plan your own travel budget. How much money do I need for Granada? Granada is a city of southern Spain located in the foothills of the Sierra Nevada Mountains in the autonomous community of Andalucia. Perhaps the most notable feature of the city is its medieval architecture that dates to the Moorish occupation of Spain. Each example stands from another time and place, strong fortresses and castles against the backdrop of lumbering mountains. Yet they are surrounded by a city thriving with modern day quirks. From castles and fortresses to bars, restaurants, and cafés, Granada is a unique setting for an otherworldly getaway. The most famous and most alluring sight of Granada is the Alhambra, a medieval complex that overlooks the city. The hilltop fortress spans a massive area, encompassing royal palaces, serene patios, and reflecting pools from the Nasrid dynasty, as well as the fountains and orchards of the Generalife gardens. Existing as the last Moorish stronghold in Europe, the Alhambra reflects the splendor of Moorish civilization in Andalusia giving visitors an inside look of the area's history. A breathtaking example of ornamental architecture, the complex is also home to the Palace of Charles V which now houses Alhambra Museum (with historical artifacts from the site) and the Fine Art Museum. Down below in Granada itself there exist more inspiring sights like the Cathedral Granada with Gothic-Renaissance-Baroque foundations, the Royal Chapel with the tombs of King Ferdinand II and Queen Isabella I, the historic and picturesque square Plaza de Bib-Rambla, as well as the Plaza Nueva the city's oldest square. Another interesting sight is the Alcaiceria, a set of winding alleyways which were originally home to a Moorish silk market under Granada's Muslim rule. Today the market holds mostly souvenir stores underneath the Moorish-style archways decorating the walls. Oriented around the intersection of Gran Via de Colon and Calle Reyes Catolicos, central Granada is the historic center and bustling heart of the city. With its many shops, restaurants, bars, and attractions, the city center is a hub for activity. Many of the buildings are situated along narrow cobblestone and brick alleys or on the edge of one of the picturesque plazas in the area, which all add a certain charm as you go about your day. Walking through the streets, the sights, smells, and sounds will take you into a world of superb architecture, good food, and friendly faces with local hospitality. As far as shopping goes, ceramics, silver, and inlaid woodwork are just some of the most famous craft products from Granada. Many traditional shops selling items like these are located along the streets of the city center. The gem of the city in Granada is the architecture, and one could spend days exploring the fortresses, castles, cathedrals, and cobbled streets. It is evident everywhere you go, even in amidst the modern bustle of shops, bars, and restaurants. Needless to say, sight-seeing and shopping can occupy much of a visit. Another unique attraction of Granada includes Aquaola, a local water park with man-made wave pool, slides, and large floats. At la Plaza de Villacantoria, visitors can take the #3 bus to get to the park. The Hammam Arab Baths, near Plaza Nueva, are another one-of-a-kind activity to engage in during your stay. Though it is a modern spa with affordable baths and massages available, the ambiance and decorations of the place reflect the ancient Muslim baths in Granada. Finally, if you're a thrill-seeker looking for some traditional action in the Spanish city, try catching a show at the Plaza de Toros de Granada, Granada's bullfighting ring. Tapas, tapas, tapas! Granada is known for serving the tasty bites free with any drink order, making it super affordable to taste your way around the city. Lunch is generally 13:00 to 16:00 (1pm-4pm), and the dinner starts from 20:00 (8pm) to the late hours of the night. Because of siesta, where most shops and businesses close for the afternoon, locals are accustomed to having dinner very late. Tapas bars can generally be found on Navas and Sarabia streets near the Town Hall, the Albaicín neighbourhood, around the bullring, or in Plaza Bib-rambla. Because the city is near the Sierra Nevada ski resort and the Costa del Sol, where tropical fruit is grown, the traditional cuisine of Granada has an exotic touch, with deep Moorish roots. Fish from the sea, country dishes from the Alpujarra, and delicious produce from vegetable gardens in the area also add a unique flair to Granada cuisine. By plane, Granada has a small airport situated 12km (half an hour with normal traffic) west of the city which serves a limited number of flights. For budget airlines it is best to fly into nearby Malaga. Iberia provides daily flights to and from Madrid. Vueling operates budget flights to and from Barcelona, Rome and Paris airports. Regular buses run from Seville, Malaga, Madrid, and Cordoba as well as a few direct services to the port of Algeciras. Malaga is well serviced by buses and is a good place to transfer if a direct service is not available. The bus station is located about 2 miles from the city center. Three trains run each day on a picturesque line to Algeciras via Antequera and Ronda. Granada is also on a stop on a line between Almeria and Seville, with four trains daily. There are also two daily trains to Madrid via Cordoba, one or two daily to Barcelona via Linares-Baeza and Valencia, and one to Linares-Baeza. For Malaga, take the Algeciras train to Bobadilla and change to a Malaga-bound train there. The train station is well served by local bus service.